This seminar presents an introduction to treatment strategies based on the philosophy of the Neurodevelopmental (NDT) approach for babies. 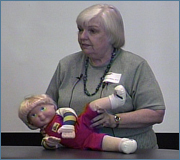 Specific treatment concepts are discussed including Mary Quinton's work, soft tissue issues in infants, adaptability of movement, and specific handling and treatment demonstration. Applicable to the birth to three population. Handouts included in PDF file format. 1. List the basic concepts of baby treatment. 2. Describe the influence of Mary Quinton on baby treatment. 3. Describe the influence of early spontaneous movements on development. 4. Describe the influence of soft tissue restrictions. 5. Describe the influence of respiration on the development of movement. Level I Introductory/no prerequisite required. AOTA Domain of OT Category 1, Texas CE Type 2, NBCOT PDUs, approved by New York State PT Board, California PT Board, Illinois PT Board. For other State PT Board approvals click on CEU Course Approvals on the CEU Course Listing Page. Complete all the seminars in this category and receive a special Certificate of Clinical Enhancement. High Speed Internet Connection Required. Wireless connections may not be consistently fast enough to watch long video files. You may need to have your computer connected directly to your high speed modem via an internet cable. Occupational, physical, speech therapists, certified athletic trainers, and other rehabilitation specialists. For special needs requests please contact us by phone or email. contactus@clinicians-view.com Phone 575-526-0012. Fax 575-526-0014. If you have an Unlimited Coupon, there is no charge for this course or its corresponding exam. This course is only available online.